I remember the first time I read Susan Hill’s now-classic ghost story, The Woman In Black. I was transported to a northern coastal village in England at the turn of the last century, and I was mesmerized by the tale. The novel was published in 1983, and it was soon adapted for TV, radio, and the stage. The play is still running in London’s West End after more than 20 years. I’ve never seen it, but I was interested to see the recent film version. A terrific horror story, a beautiful setting, a good director (James Watkins), and a talented cast led by Daniel Radcliffe: what more could you want? I finally saw the film last night on Showtime, and it’s good. Watkins kept the presentation of the story simple and straightforward, and it’s technically perfect: scenery, cinematography, editing, music, etc. Daniel Radcliffe is quite good as the (literally) haunted protagonist, and the supporting cast is excellent. Still, much as I enjoyed it, I didn’t get the same thrill I got when I read the book the first time, or even the second time, and I wondered why that was. After thinking about it, I have a theory. In the case of the unknown–like, for instance, a vengeful ghost haunting a remote seaside village and causing terrible mayhem–the mind is more powerful than the eye and ear. As faithful as the film was to the spirit of the original novel, nothing in it is as frightening as Susan Hill’s evocative prose. Imagining a ghost can be scary, whereas watching an actress pretending to be a ghost is not nearly the same experience, no matter how good she is (and Liz White, the actress in the title role, is very good indeed). The best supernatural tales can’t be fully realized in literal terms, no matter how well the artists try. Watching The Woman In Black reminded me of similar experiences watching film versions of other favorite horror stories. The Haunting, Robert Wise’s 1963 film of Shirley Jackson’s The Haunting of Hill House, and Stanley Kubrick’s The Shining (1980), based on the Stephen King novel, are prime examples. Taken by themselves, they are both wonderful films, and they’ve certainly scared a lot of people over the years. But neither movie is anywhere close to being as scary as the book on which it’s based. Why? Because we can create worse nightmares in our minds than even the best directors can capture on film. 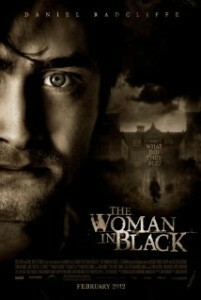 I recommend the movie of The Woman In Black, and you should see it. But you should read the book first. In the thrill department, there’s really no comparison. This entry was posted in Books, Movies, Recommendations by Tom Savage. Bookmark the permalink. Thank you for the recommendation. I have seen the 1989 version, but haven’t read the book or seen the recent movie. I will give them both a try. Thanks, Misty–but be sure to read the book first. It’s a bit different from the film, and the changes are interesting. Enjoy! I first discovered the Woman in Black through the stage play, one of the creepiest stage experiences I have ever seen. Saw it several times, taking different people to see it over the years. Only within the past couple years I read the book and thought it was great. When the movie came out, I had to go to the theater. It still made for a good, suspenseful ghost story. Daniel Radcliffe was very good and some scenes were incredibly intense. I think the end of the movie caused it to not linger with me like the play and novel. The “Hollywood” ending was the only disappointment I think I really had. And have reservations about the sequel being made. You also mention the experience of seeing Kubrick’s The Shining. For me it is still the scariest movie I have ever seen (and one of the very few movie adaptations I enjoyed over the novel-mainly because Kubrick took what was a standard haunted house story and made it something more).